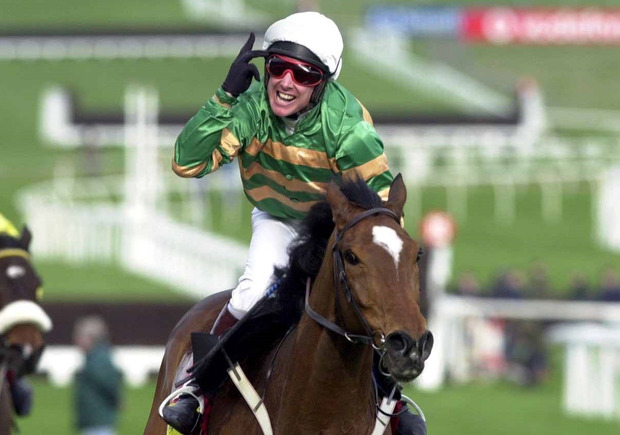 WINNING WAY: Jockey Charlie Swan, the rider of Istabraq, “never eats late at night”. This plan is cunning marketing and it may even be illegal if there is no excise duty being paid. The chipper man from way up the country who was nearly gone broke is harvesting the money into round bales. Thanks to the plan. Or so I'm told. The man from the chipper van up the country is a certainty to become president if he runs in seven years' time. He is strategic. Here's the plan, the one that saved his business from certain ruin. The man from way up the country owns a fast-food outlet, I'm told the food really is fast in that it's barely cooked. The chicken is red inside but the lads are so full of drink they hardly notice and the barbecue burgers are served with smoked salmonella, which is a variation on surf 'n turf. His pizza crusts are as thin as a CD, and just as hard. There were rumours he was using dog food as burger meat on the basis that if it doesn't kill dogs well then it won't kill humans. The lads were so sick after the drink they hardly noticed the occasional dose of botulism. I might just interject at this point to all the fast food people I blamed in the wrong over the years. When I was a young lad it was the custom to drink to excess and the hangovers were horrific on Sundays. The mother would be going to the trouble of cooking a lovely dinner and I had to say I was too sick to eat because I got a bad burger the night before. Back to the plan. The waste cooking oil from the chipper is piped in to the fuel tank of the owner's old banger and the car is driven around his town around closing time. The old banger vomits and coughs out enough phlegm to negate the greenery of at least 20 wind turbines. But the emissions from the car exhaust are pure chip shop smell, which is a Pavlov's bell to anyone who is in the vicinity and they go mad for chips, especially if they have a few pints in. Men who sleep with their windows open at night woke with an unappeasable craving for quarter pounders. It's like when you get the coffee aroma outside the café and the immediate reaction is to buy a cup of Americano or a latte or a cappuccino. I only do instanto in our pub. Here's my barista recipe. Place one teaspoon of coffee in an empty mug. Add boiling water. The reason I gave the recipe is I was a taster at the opening of The Listowel Food Fair on Thursday night. Colette Twomey, the managing director of Clonakilty Black Puddings, opened the fair, which takes place over the next few days. Colette is an eminently practical woman. Her success is down to "a passion for using our own produce which is completely traceable and is the envy of every country". Simon Delaney and Lizzy Lyons, who cook together on Simon's Sunday show, were funny and entertaining. Lizzy is a local girl who opened Lizzy's Little Kitchen in Listowel with her husband. It is a phenomenal success. Listowel has now become a food town. I know I'm a local boy, but come and visit. Our food offering is up there with the best. Simon's cookbook is on the shelves right now. I woke up very hungry this morning. I wonder was there someone driving a chip oil van? I chanced making the French toast and it was a great success. The book is easy to follow. The man is a born communicator. We never got in to food in John B's. Dad and myself were chilling with our feet up on the stools one day. Mam must have been away because women hate to see men stretched out when there's work to be done. We had some laughs. I so miss stretching out with my stand-up dad. Then these tourists came in and asked us if we served food. "No we don't," replies dad without ever getting up off the seat, "it gives us all we can do to cook our own dinner". Most pubs do food now. They have to. It's tough on the country pubs who do not have the passing trade to justify the expense of fitting out a kitchen. We did manage to serve up a one-off brought in dinner for the food fair. Award-winning chef David Mulvihill put together a feast made from organic Tamworth pork. Mully is a genius and does not do stress. One of the courses was sweet and sour pork, but with all kinds of dainty culinary twists and subtle infusions. I had no hand in cooking the food. I was told to stay out of the way, but I did get at the menu. The main course goes "Organic Tamworth pork piquillo ying-yang on saffron-scented rice, accompanied by the delights from fruits of the vine from Forrestal Wines". That's sweet and sour pork. Before I forget, Jameson is doing a whiskey tasting in John B's tomorrow night at about 7.30pm. All proceeds go to Breast Cancer Ireland. I was thinking of doing up a menu for the man from way up the country with the aromatic exhaust. He's no worse than the television stations who are killing thousands from obesity. There should be a cut off from all food programmes at 9pm. There's no hope of making duck à l'orange from scratch at 11pm, after some lad from Provence provokes the juices down the crevasses of your cheeks like an alpine flood. It's a case of I want it and I want it now. So what do we do? Order in a take-away. I asked jockey Charlie Swan, the rider of Istabraq, how it was he kept so fit... "I never eat late at night," was Charlie's advice, and it works. I hope the man from way up the country likes this custom-written menu entry. "Flambéed diced escalope of poulet du ferme, tossed and parsed in golden crumb, with a piquant en rose tangy pottage." That's chicken nuggets drowned in pink sauce.